After this morning's visit from four local does, the little deer herd bedded down in a nearby thicket, and we returned to our Thanksgiving preparations. A few hours later our neighbor, Jane, called to tell us the deer were out again and boldly munching on fallen apples next door. As we watched through our sliding glass door, the hungry foursome wandered casually over into our back yard. They frolicked together for a couple minutes, then spied some delicious goodies in our smaller garden (the one we've all but given up on). As they sampled the treats found there and in the pine tree hedge, the does approached to less than five yards away. We moved to the bedroom window for a better view. I grabbed the camera again, took some more still pictures, and then shot a couple videos, too. I'm sure they knew we were right there behind the glass, but they were hungry and unconcerned. This morning's thaw removed a two-week ground-cover of snow, revealing all sorts of tasty deer food. The largest doe was the boldest, once again. She preferred to snack on something yummy she found in our pine trees, just beneath the bedroom window. She looked right at me several times, then continued munching casually each time. After an hour or so the four deer headed back up the hill to see what other Thanksgiving delights were available. These same four deer visited us this morning. See more deer pictures taken near Whitney Road in Fairport earlier this year. How about you? Do you have any wildlife pictures you'd like to share? If you'd like to submit yours for possible posting, you can reach me via Comments or by using the link at the top of this page. We had four unexpected guests on Thanksgiving morning. They arrived early and unannounced, but kept mostly to themselves. Their manners were impeccable. We didn't get their names. They wandered around in the back yard, nibbling on the garden greenery and posing for a few pictures before they bedded down in our neighbor's hedgerow. Three does sample our garden's bounty. One doe poses while the other finds a succulent treat just beneath the snow. The smallest of the four deer keeps a watchful eye. The largest doe was also the bravest, lingering just a few yards away from our balcony deck. She didn't eat much, but she seemed hungry for a visit and some gossip. See more deer pictures taken near Whitney Road in Fairport earlier this year. There are signs all around us, if we keep our eyes and our minds open. We interpret those omens or portents the way we see fit. Sometimes I decide that a particularly beautiful sunset has appeared just for me. A welcome to the new day of my very own. I'm not especially superstitious, but I'm also not afraid to assign significance to seemingly random events around me. After all, it's what you do with a "sign" you interpret as meant for you that really matters. Do you change your course when a black cat crosses your path? That's superstitious and slightly silly. On the other hand, if you change your driving habits when you narrowly avoid a terrible collision because you "had a feeling" -- that's making good, sound use of a "sign." Over the years I've locked eyes with a feisty crow, been mesmerized by the jerky ballet of a foraging squirrel, and been awed by the grace of a circling hawk. I've watched my kids play together and listened to their laughter, without them realizing I was paying attention. Looking outward at the often overlooked activities around us gives us pause to look inward with insight, too. Are there signs all around us, every day? Sure there are, if we only know how to interpret them. You can't find the meanings listed in a book. And your message won't be the same as mine, even if the sign we see is identical. What we see when we look, what we notice in the collage of life around us, and what we make of whatever catches our attention all relates to what is in our minds and in our hearts on that day in that moment. Like it was planted right there for me to see. What do you see in the photo that heads this post? That's one piece of my bluestone sidewalk with an ordinary leaf flattened against it. Maybe that's all you see in the photograph. I saw it as a sign. The evening I took that picture, I'd been having one of those days. You know the kind: three or four small irritations pile up into an emotional mountain. I was half-way miserable, ready to snap at anyone who crossed my path. 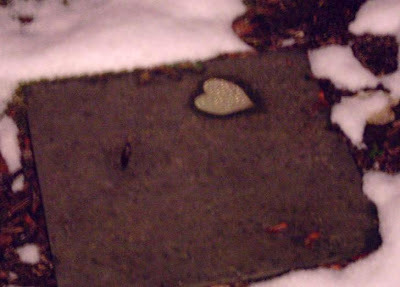 And then, there on my sidewalk, I saw a gleaming heart surrounded by a frame. Saw it so clearly that for a moment I thought my wife has pasted it there for me to see. In a way, she had. I just needed a reminder that love is all around me; I just had to keep my eyes open. How about you? Do you have a photograph you'd like to share? If you'd like to submit your photograph for possible posting, you can reach me via Comments or by using the link at the top of this page. We are a family of meat lovers. The grill gets fired up every weekend, rain or shine. It can be a hundred and ten or twenty below - we have to get our fix! Steak, chicken, pork chops; every Saturday is a carnivore's dream. After ten years of marriage, I'm still getting used to it. I grew up as the eldest of nine, and we were dirt poor. I could make a pound of hamburger serve the whole family for four meals straight, with creative use of spaghetti sauce, potatoes, rice and beans. I had never had a honest to God, home-grilled steak before I got married on my twenty fourth birthday to a real man: a hunting, fishing, red necked card-carrying member of the National Grill Masters Association. Let me tell you - it only took one juicy Porterhouse to have me firmly addicted. Now, ten years and three kids later, we are firmly committed to keeping the cattle industry alive and well. Even our eighteen-month-old loves nothing more than sinking the twelve teeth he does have into a tiny portion of succulent rib-eye. I like garlic, and just a touch of pink in the middle. Hubby likes lemon pepper - and lots of it; and he doesn't freak about a little reddish juice on the plate. We both love Lee and Perrins. The kids don't share our passion for spice - yet - and theirs better be well done! When you have five steaks on the grill, it's kind of hard to keep track. You have to keep cutting them open, and trying to figure out which one is seasoned and which one isn't. That's why I couldn't believe it when a friend turned me on to Grill Charms™ . These little suckers are perfect for helping hubby keep track of which steak belongs to who, and the kids love the concept of being able to personalize their own cut of meat. 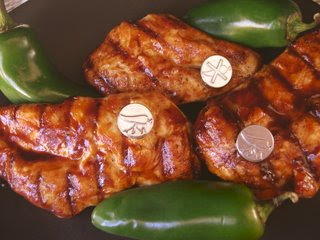 Grill Charms™ are made of stainless steel, look like dime-sized thumbtacks, and have serrated edges so they stay in the meat during grilling. The designs on top of each one let you differentiate the meat. 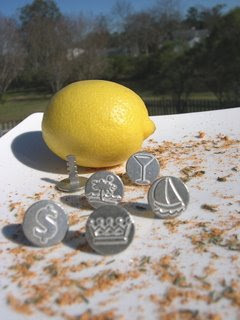 I have already picked out the Charmed Life collection, which features a sailboat, a dollar sign and a crown among other designs. I am aiming for the Spicy Collection next, so I can tell the kids' mild chicken piece or pork chop from my own tangy rub! I'm going to have to get the Steak Collection for those times we have friends over that want to specify bloody or burnt, and I'm definitely picking up the Pink Collection for my aunt for Christmas. She's a breast cancer survivor, and her hubby also is a member of the Grill Masters Club. At under $20 per six-piece Grill Charms collection, I might have to grab a few more sets for stocking stuffers - hubby and I have a lot of meat loving friends! Check it out folks - this is the new 'hot item' for the grilling carnivores in your life; and if you're like me, you won't be able to stop with just one set! I'm a grilling gadget gal from Charleston SC and I have invented the perfect gadget for those scrumptious dinners cooked in great outdoors. Flame-toasted marshmallows. Need I say more? This one's written for a reason. See why at 22 Words, Experiments in getting to the point, a contest that ends in a couple hours titled, The joy of blogospheric brevity. Volunteers are needed for trail work at Harriet Hollister on Sunday Nov 9th and Sunday Nov 16, 2008. Work sessions will be from 8:00am to Noon; meet at the parking lot on Canadice Hill Road. Volunteers 18+ will be required to sign a liability waiver. Work will include clearing new growth on trail sides and other trail enhancements. Volunteers should wear work clothes/gloves and should bring trimmers/pruning saws/shovels/rakes. Please contact info@xcrochester.com if you have any questions or to confirm that you will be participating. 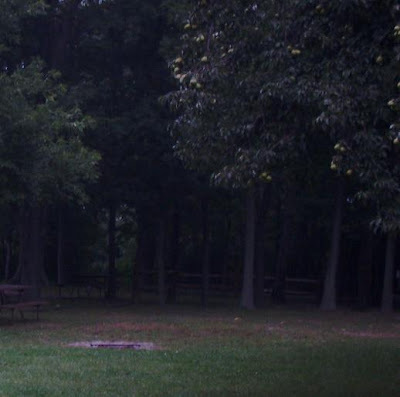 Jim's note: If you're a New York State outdoors enthusiast, this is a wonderful resource. Sue and Rich Freeman do a wonderful job of rounding up topical info from all around the Empire State. 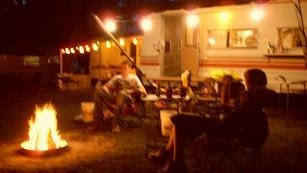 In case you don't remember me, I'm the one who hates camping. Today, I am listing another of my objections to this strange tradition. That would be bears. 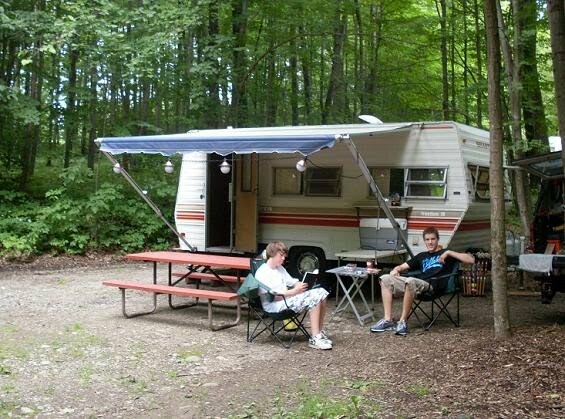 Unfortunately, when it comes to camping out, bears are the rats of the campground - pesky, fearless and eager to sneak the crumbs…only in this case, the crumbs can mean the entire contents of the garbage, the cooler, or possibly your tent. Don't give me that Blueberries for Sal propaganda. Why would a bear be content with a few berries when it could feast on blueberry-fattened human? In my opinion, Blueberries for Sal should be on the banned books list as it can lull people into a false sense of security. For those of you who haven't read the delightful but erroneous book by Robert McCloskey, the story line runs something like this - Sal and her mom go to pick blueberries on Blueberry Hill. They become separated and Sal ends up following Momma Bear, while Baby Bear trails along after Sal's mother. They cheerfully tromp along eating blueberries all 'round, then parents and progeny reunite happily. THIS IS RIDICULOUS. I am afraid this book may have caused countless bear encounters to go horribly wrong. I humbly present the HOW TO DEAL WITH BEARS WHEN CAMPING checklist, annotated by myself for clarity and reader usability. I have carefully researched the key points from several Game and Fish Department bear safety guides, combined them with my common sense as a mother, and sincerely hope this post will serve to undo some of the damage inflicted by Blueberries for Sal. Finally, my favorite 'bear encounter tip' of all time - Remember, you can't outrun a bear. However, if you can outrun the other guy, you should be OK. If you can use him as a springboard to get up into the tree, that's good too. Hopefully these tips will serve to make people realize that a merry day picking blueberries with the bears JUST AIN'T GONNA HAPPEN. Remember the bear guy? Swore up and down you just needed to try and UNDERSTAND the bears, and what happened to him? GOT ATE BY A BEAR. (What's worse, he took his girlfriend down with him. Now, that was just plain wrong.) I bet he read Blueberries for Sal as a kid.